When you have teeth missing from your smile, it can be very difficult to be confident and secure in the way you look. 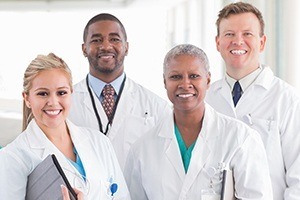 Many people consider a smile a first impression, and when you are not secure in that, it can be difficult to live the happy, carefree life you want. Though dentures and partials are one way to tackle the issue of teeth missing, you may want to opt for a more permanent solution that does not require as much maintenance. Dental implants are an amazing way to have a full, beautiful smile while also being as enduring and natural-looking as possible. 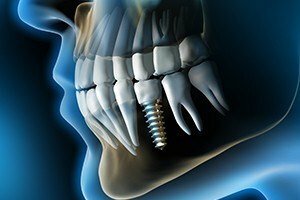 Why Choose Dr. William Eick for Dental Implants? 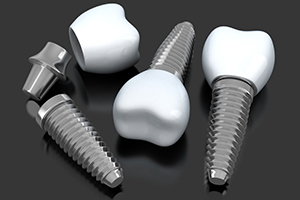 A dental implant is a small piece of biocompatible titanium that is placed directly into an empty tooth socket. The titanium post-like implant will act as a new tooth root and will prevent the rest of the teeth in your mouth from shifting to make up for the empty spaces due to the missing teeth. The bone in your jaw as well as your gum tissue will bond with the implant over time, creating a strong, permanent bond. 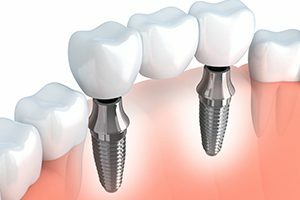 After the right amount of healing time as passed, a crown is added on top of your implant- a crown that exactly resembles a natural tooth. At the end of the procedure, you are left with a beautiful, full smile you can be proud of. Dental implants can be used to anchor a dental crown to completely recreate a tooth or to hold a fixed bridge permanently in place. Both solutions create a natural-looking row of teeth that you are ready and willing to show off at any given moment! Also, with dental implants, you will be able to laugh, eat, and speak normally, as well as with more confidence. One of the benefits of dental implants is the fact that you can regain your confidence that you may have lost. When you feel positive about the way you look, that positivity can leak and spread into many areas of your life, and Dr. Eick wants to make that happen. He will take his time with you, discuss how you envision your new smile looking like, and develop a plan around your wants and needs. Either way, you are sure to have amazing results! After an implant root has been placed into the jawbone, Dr. Eick can directly attach a dental crown to it using a small connector called an abutment. This tooth will be able to stay firmly in place on its own and won’t require the alteration of the surrounding teeth, helping a patient better preserve their natural smile. 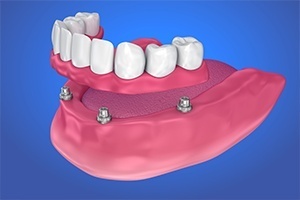 If a patient is missing three or more teeth in a row, rather than replacing each one with individual implants, just two implants can be positioned on either side of the gap to hold a bridge in place. Compared to a regular bridge, implant bridges look more natural, have a better fit, and can be trusted to last longer as well. 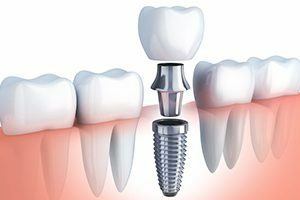 Even patients who are missing most of their teeth can benefit from dental implants. Using a few strategically placed posts, we can anchor a denture directly to the jawbone, providing a security and strength a typical removable prosthetic simply can’t match. And, implant-retained dentures have also been shown to restore much more of a patient’s bite force, enabling them to enjoy a wider variety of foods with ease. Dr. Eick works with a network of local oral surgeons and periodontists to surgically place implants for his patients. His partner-specialists have literally placed thousands of implants over the course of their careers, so he completely trusts them to give his patients’ new teeth the strongest foundation possible. Once a patient has had time to heal from placement, they’ll return to Dr. Eick’s office to receive their custom-made restorations. As with any dental treatment, cost is always a factor that is on people’s minds. The price of an implant procedure can vary quite a bit from patient to patient based on their particular needs, such as how many teeth they want to be replaced, where they are located in the mouth, and what kind of restoration is going to be used. While implant restorations do tend to cost more than other replacement options, they are actually the most wallet-friendly long-term. Traditional bridges and dentures may cost less, but they usually need to be completely replaced every 7-10 years, compounding their price. Implants, on the other hand, can easily last for 30 years or more, making them a onetime expense for most patients. Add this to the fact that implants provide superior aesthetics and function, and you can see why they are largely considered a wise investment.